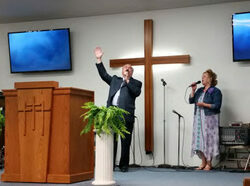 In addition to assuming all the responsibilities of pastoring, Pastor Jerry also leads the church in congregational singing as well as singing with Sister Lorinda and Gloria (Grubbs) Wright (pastor's sister). 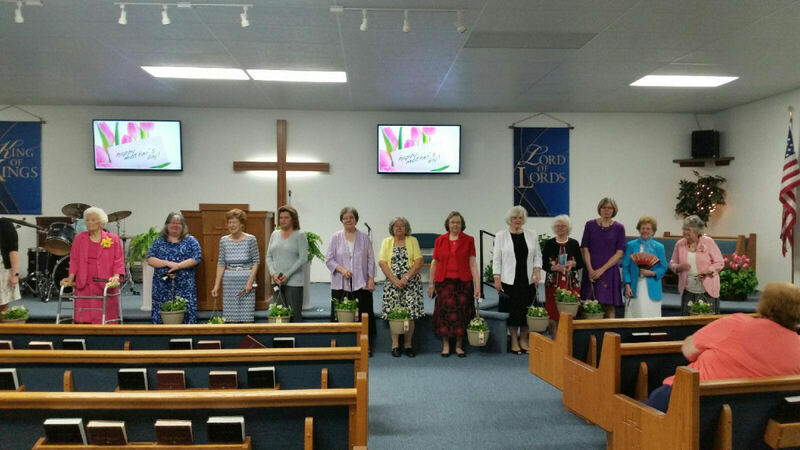 Sister Lorinda is the organist; Gloria is pianist. 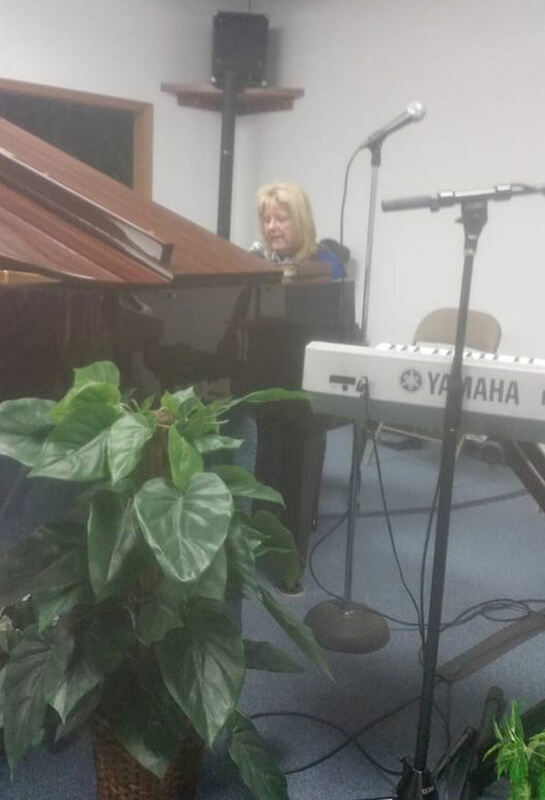 Karen Grubbs is at the keyboard and David Grubbs on drums. Guitarists are Jim Carter, Huey Dodd, Ernie Porter and Jarrett Grubbs on bass. 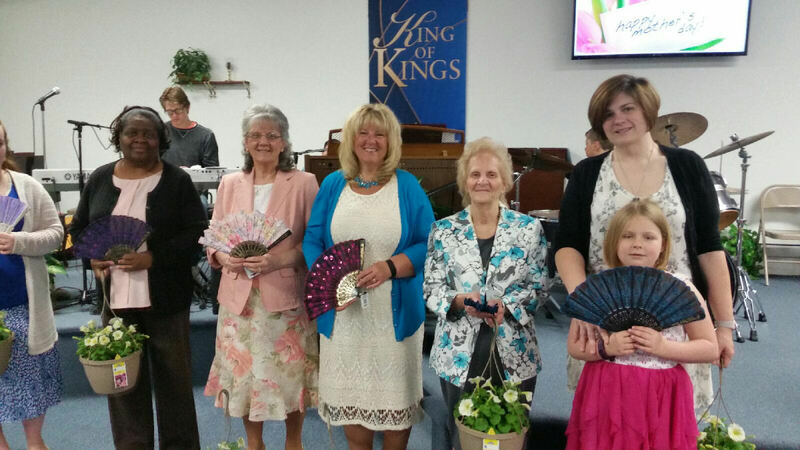 The church appreciates all the different "hats" that the pastor and wife wear. They are often called upon to be custodian, plumber, repair person, janitor--wherever needed. 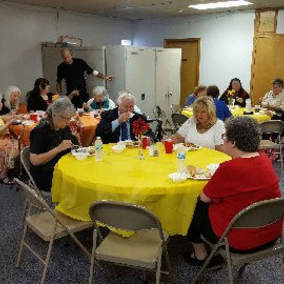 We also appreciate all our laity who so generously give of their time and talents to help keep things running smoothly. We have a loving, giving congregation! To navigate, use Menu at the top each page. 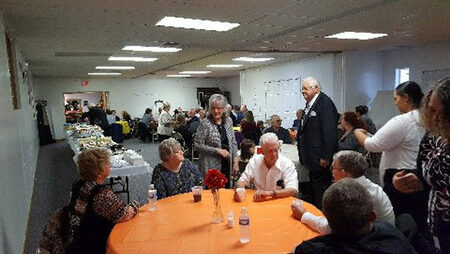 ​ Sign our Guestbook, go to Menu at top of page or the link at the bottom of page. 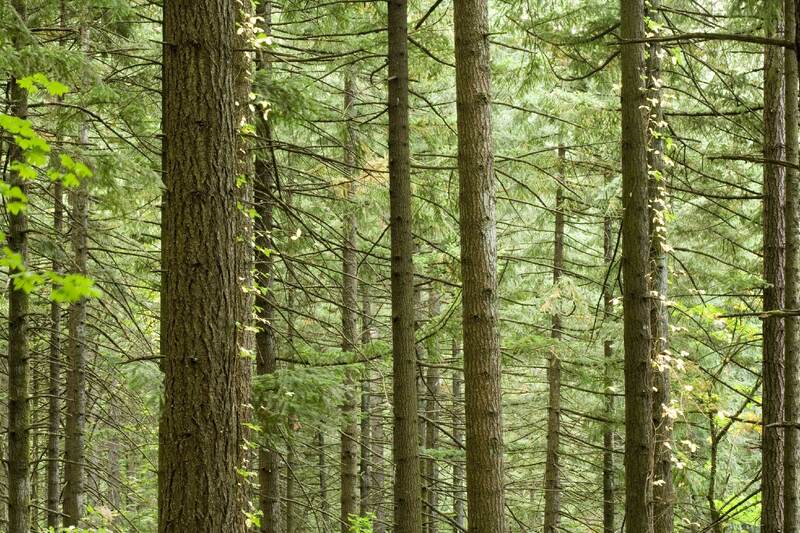 ​Join our mailing: go to the bottom of "Contact" page. 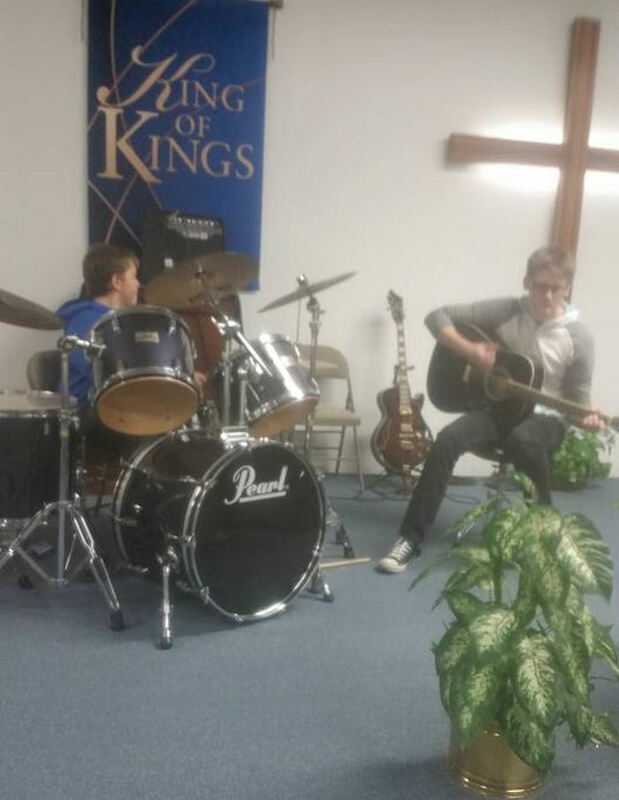 We had a work day (actually several days) this past week and all the musical instruments were rearranged to better serve our musicians to be able to coordinate their music. We appreciate all those who gave up their free time to help move things to the present location. 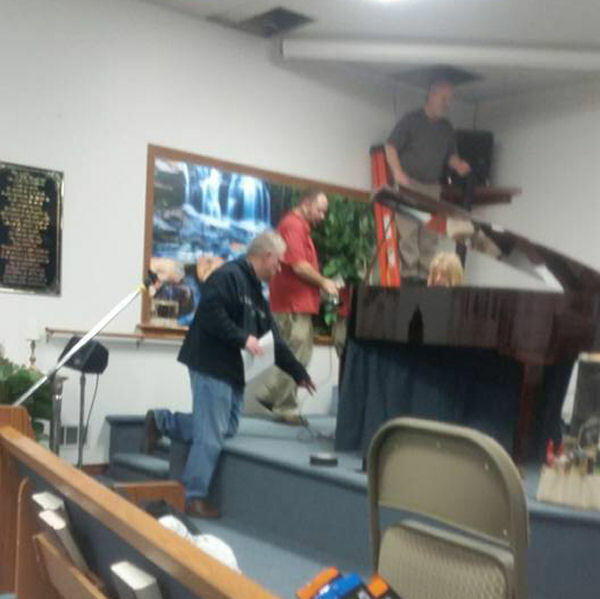 It required some rewiring as well, and we had volunteers who knew exactly how to put it all together. 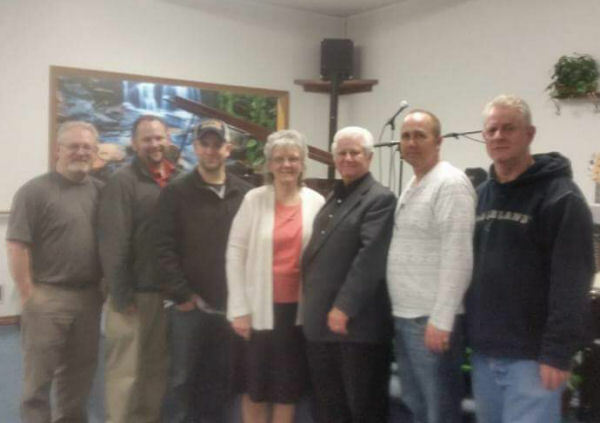 Pastor Jerry and Sister Lorinda, Jerry Jacobs, Ken and Karen Jacobs, Ken Jacobs Jr., Keith Jacobs, Keith Cornelius. 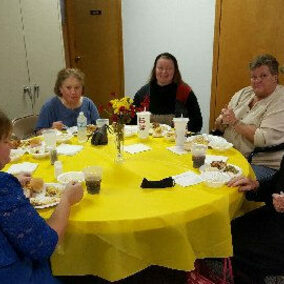 Karen Jacobs provided food for the group. They are meeting again to check things out and try out their new arrangement. Karen, Keith C, Keith J. We had a beautiful communion service this morning commemorating "Palm Sunday" as we recalled how our Lord gave His life, shedding His precious blood to cleanse us and make us worthy to be one His beloved. Easter season is such a blessed time when we are reminded of how much we are loved by our Heavenly Father who gave His Only Begotten Son that whoever believes on Him has everlasting life! 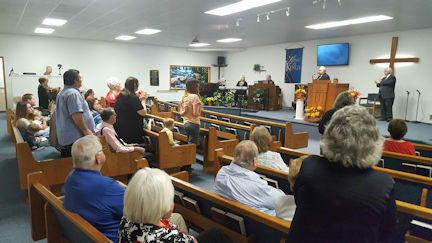 We had a wonderful Easter service and a beautiful full capacity congregation who came to worship with us. 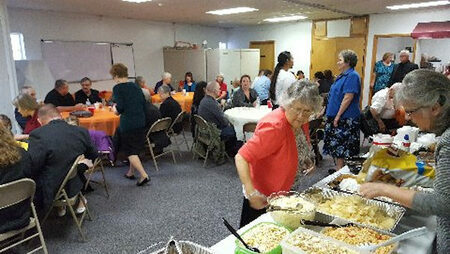 We appreciate all who came, and we especially were thankful for the risen Lord who blessed us with His presence! 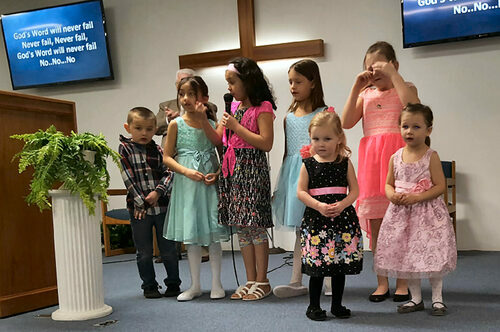 After service, the children enjoyed hunting for filled plastic eggs hidden around the outside of the church. 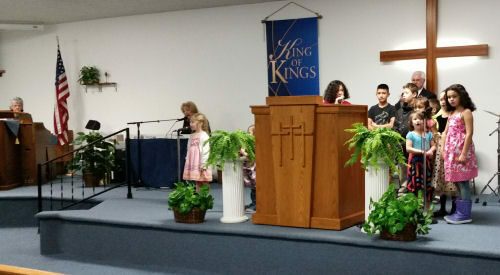 (pictures of egg hunt on the Youth Activity page). If you don't have plans to attend church somewhere, we would love to see you on Sunday. Come, join us. 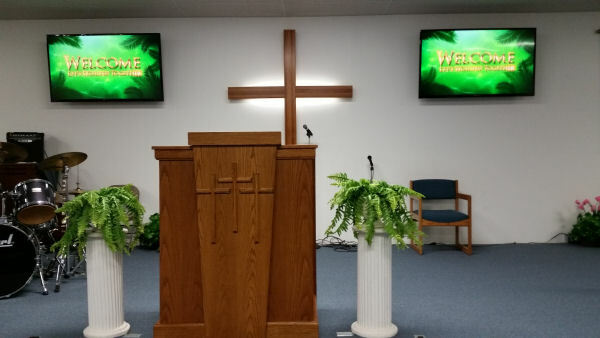 Each service is a celebration of the RESURRECTION OF JESUS that changed the whole course of the world and brought salvation to those who would accept Him as their Savior. This was not just a one-time event in history; it is an every day fact of life. 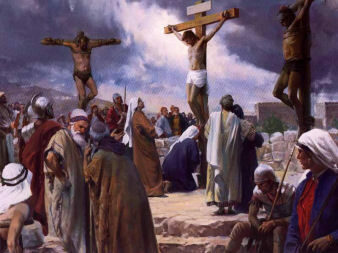 Jesus died on that cross to redeem all of mankind, He arose with total victory for all who would receive Him and is alive today guiding us toward that victorious day when He returns for us to be with Him forever in His Kingdom! 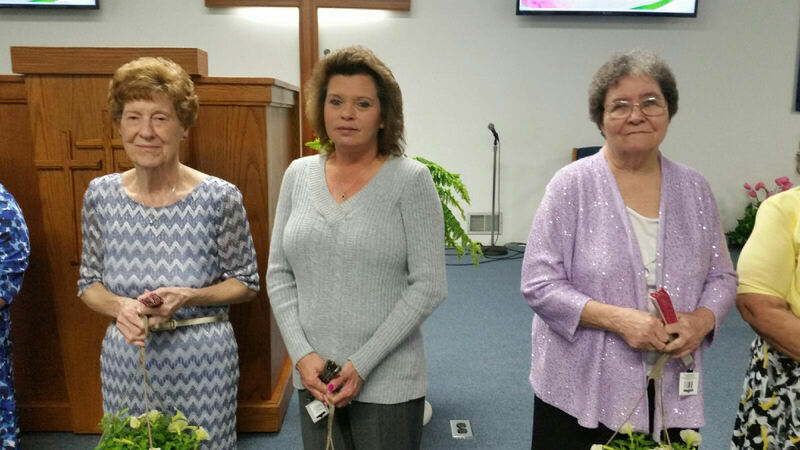 Sunday Morning, April 24, 2016 we were blessed to have Rev. 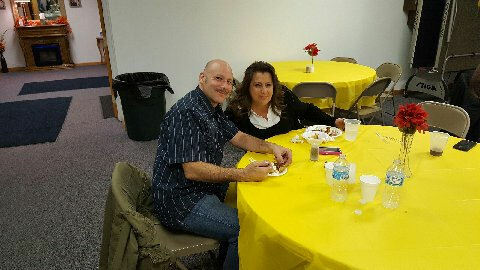 Jay Walden, his wife Tammy and daughter Charity with us. 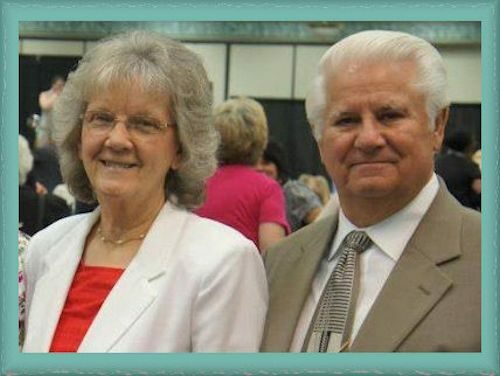 Brother Jay is our National General Overseer from Jellico, Tennessee. 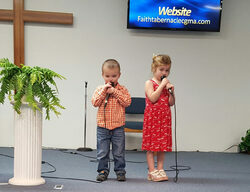 He and Sister Tammy ministered in song and he preached a rousing sermon reminding us of the importance of -- "building up yourselves on your most holy faith, praying in the Holy Ghost" (Jude 1:240). 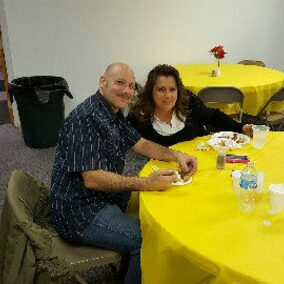 Our folks always love having this inspiring couple minister to us. "You are looking at a miracle here. 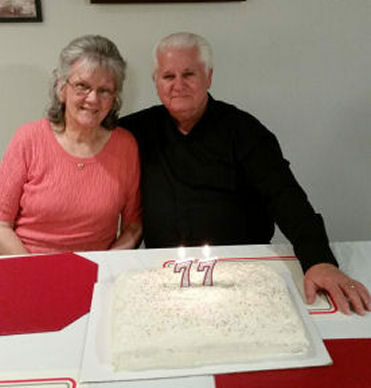 Our Pastor's sister, Mary, had been in the hospital for more than a year with a mishap from a simple hospital test. Churches everywhere prayed and still at times it looked like hope was gone. 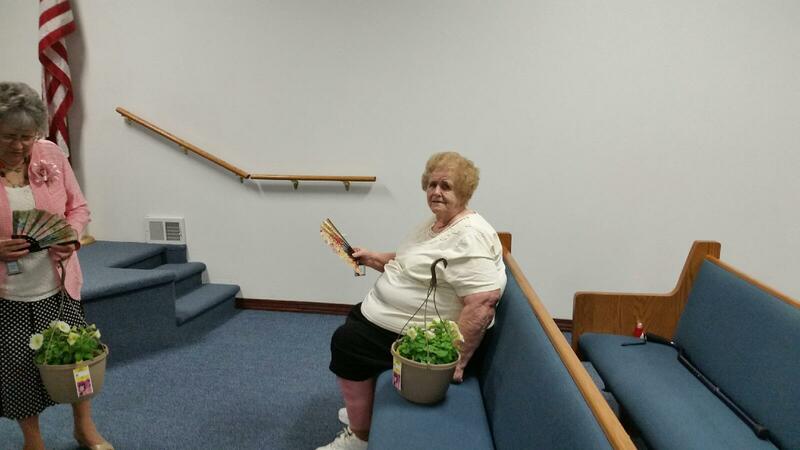 This is Mary's first time back to church after 18 months. Rev. 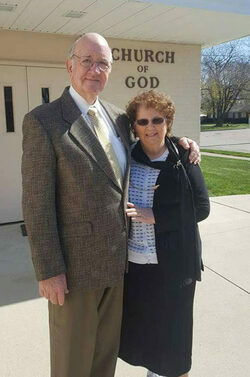 Fred and Mary Cornelius Pastored the Monroe, MI church many years before retiring, at which time Rev. 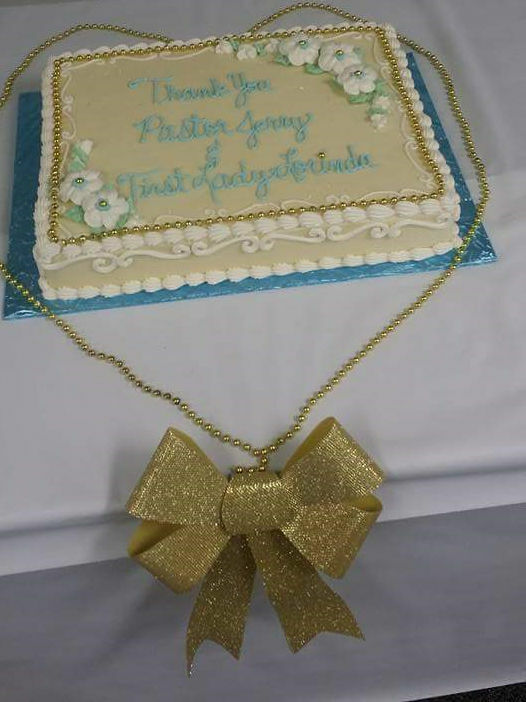 Fred served in office as the National General Overseer of the CGMA.."
It was truly a time of rejoicing for the church who had been praying for Sister Mary for so many months when it looked hopeless that she would ever leave the hospital alive! God is GOOD! Keith Cornelius, son of Brother Fred and Sister Mary, ministered in song, one he had written for his mother: "I'll Never Give Up!" 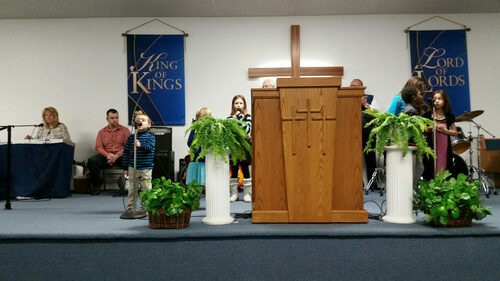 Come, join us as we worship the "KING OF KINGS" and "LORD OF LORDS"! 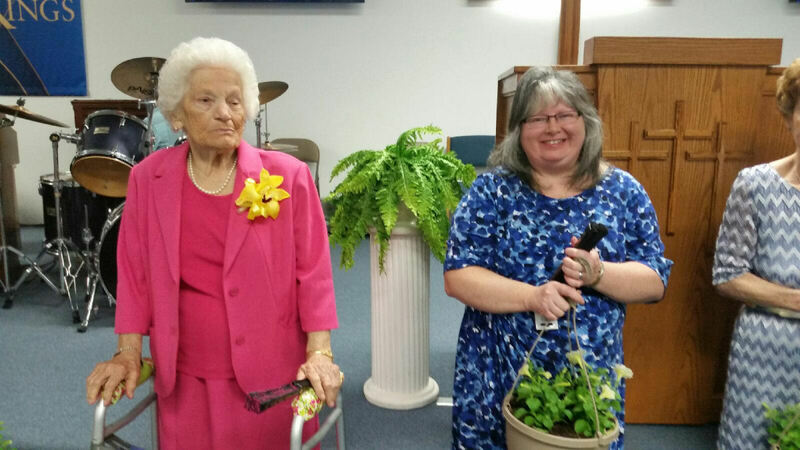 Brother Gerald Jacobs called Sister Lorinda from the organ to the podium for a gift and flowers for Mother's Day. 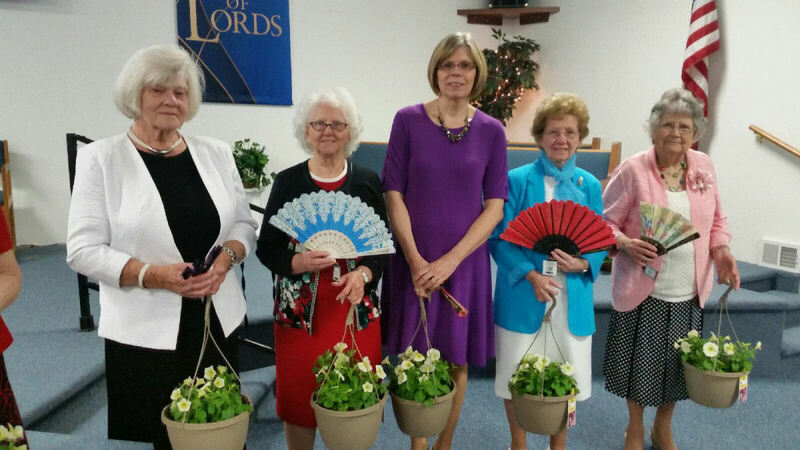 All the ladies received a hanging flower basket and an ornamental folding hand fan from the church. Pictures below. Click on each picture to get the full view of all the ladies. Pastor Jerry's sermon was relative to listening and being obedient to the Heavenly Father's words for a successful life. 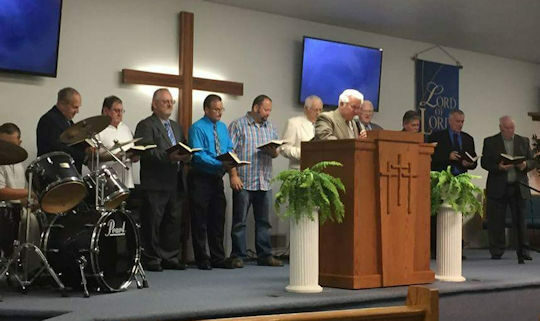 After the sermon, he had all the men come to the podium and sing "Just a Little Talk With Jesus." 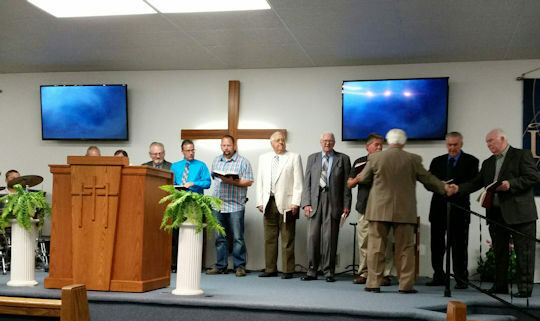 After shaking hands with all the men, Pastor Jerry led the men in the selected song. 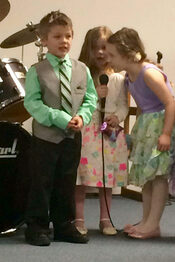 Even the reluctant singers participated. 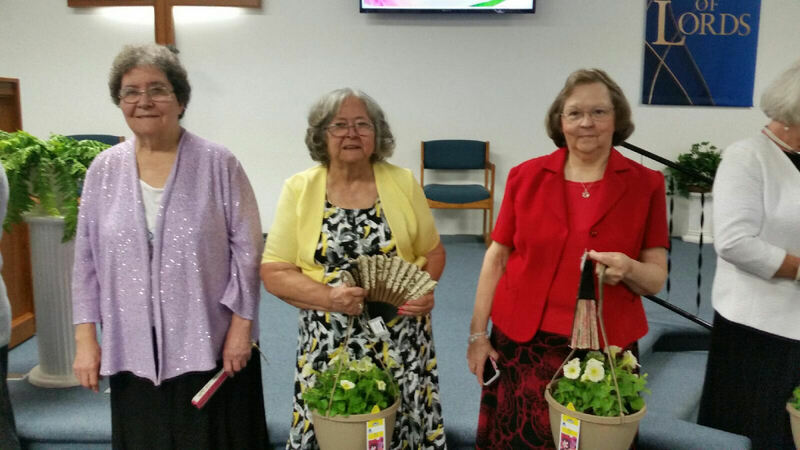 Ladies of the church had prepared a "goodies" bag for each father. 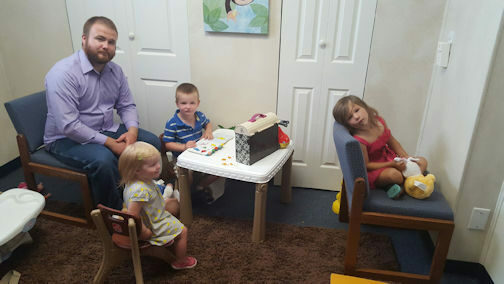 All fathers were asked to come to front of the church, and they each received their Father's Day "Goodies Bag." 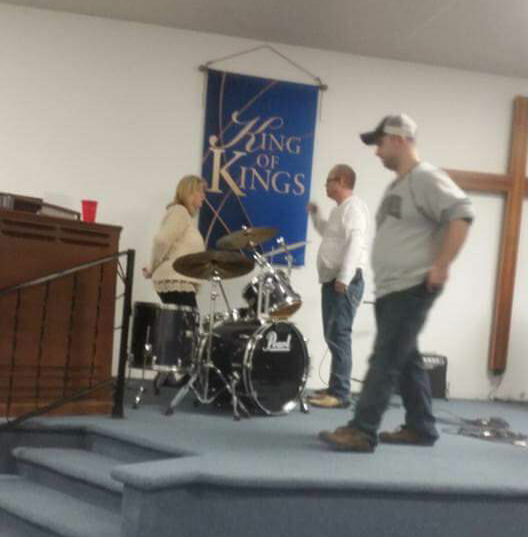 (The young fellow at the drums is Pastor Jerry and Sister Lorinda's great-grandson, Nathan. 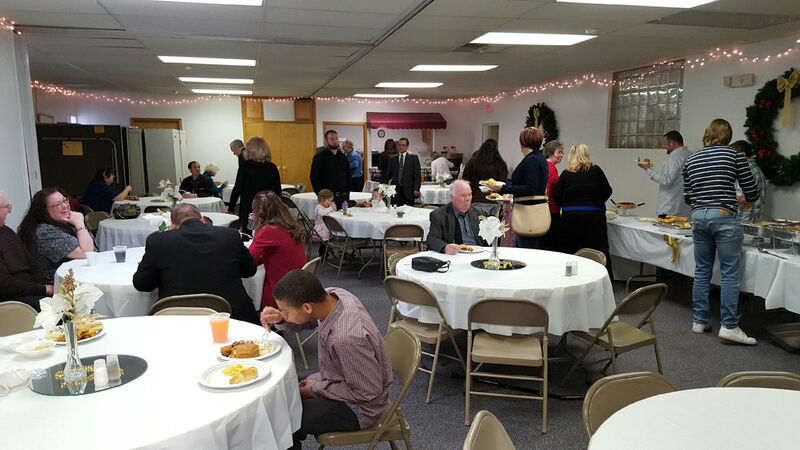 The church appreciates all the men of the church. 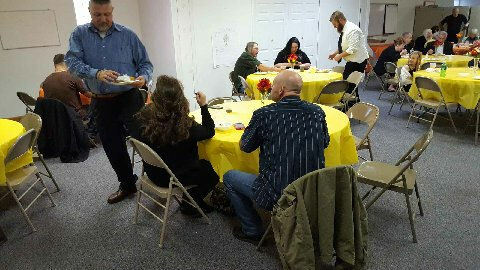 Love was demonstrated and exchanged among our congregation in an after-church fellowship as they left for their own Father's Day activities. 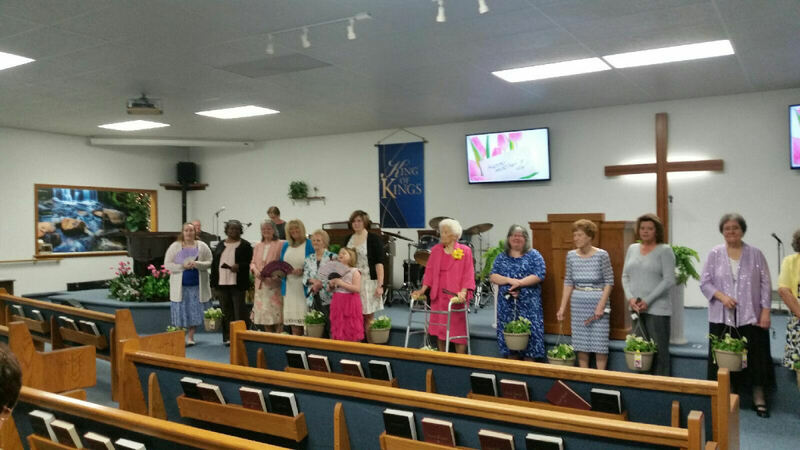 The church is blessed by the dedication of those who take care of our children during morning worship service. 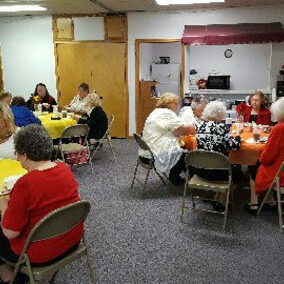 They prepare lessons, snacks and activities for the children while worship service is going on. 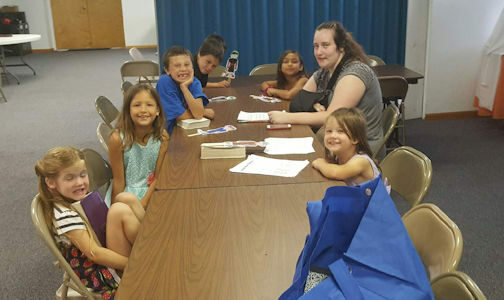 Among those helpers are Josh and Rebecca Stoddard who give of their time to make this a worship time for the children also. 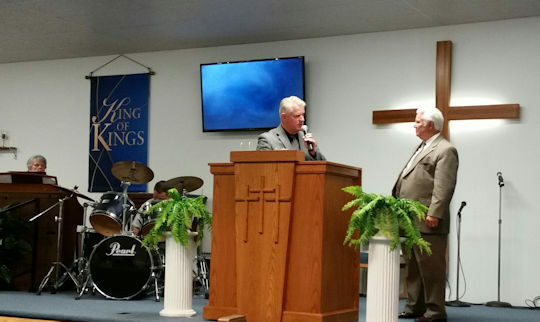 Faith Tabernacle was blessed to have our former General Overseer, Rev. 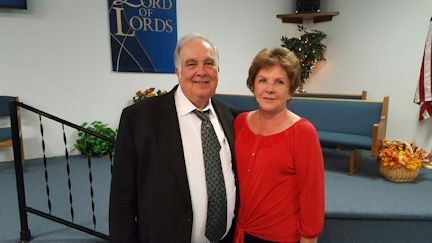 Donnie Hill, and his wife, Donna, with us for the evening service on October 2. 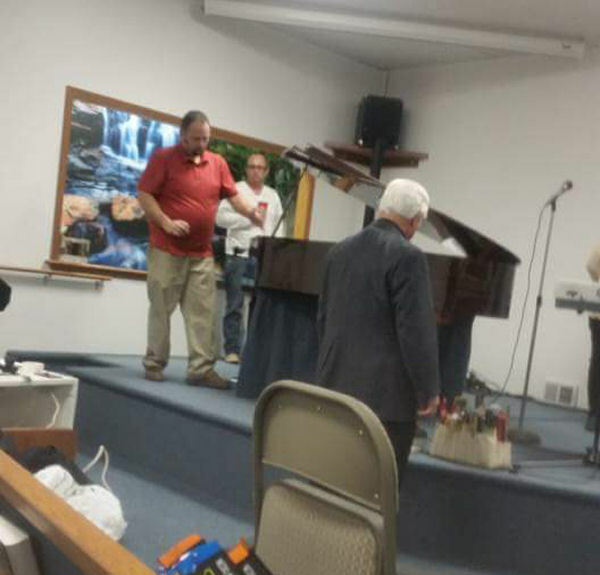 Brother Hill played his saxophone and then delivered an annointed sermon on the importance of prayer and its far-reaching results. 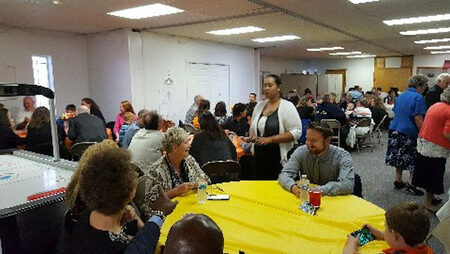 After service, we moved to the fellowship hall and were treated with a wonderful and varied meal. 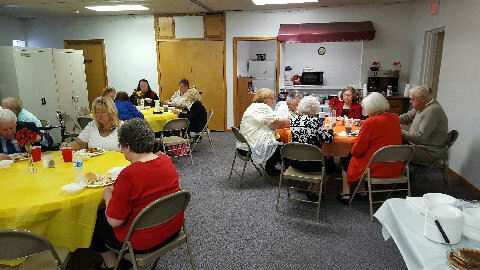 It was an opportunity to fellowship and catch up on each other's lives since our last get-together. 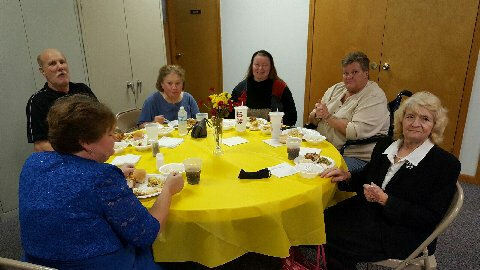 Our folks really know how to spread out a great table; food was good and plentiful! October 16, 2016. Age 73 of Lincoln Park. Beloved husband of Mildred. 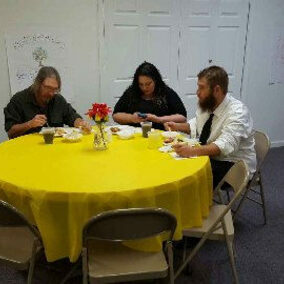 Loving father of Angel (Jerry) Driggers, Shannon (Carl) Yarborough and Richard. Dear brother of Bobby (Helen), Bill (Sharon) and John. 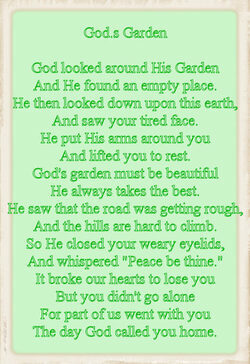 Dearest grandfather of Stevie (Pete) Briley, Asia (Clint) Holder and Ty Bell. Loving great-grandfather of Amaya Holder and Mason Briley. 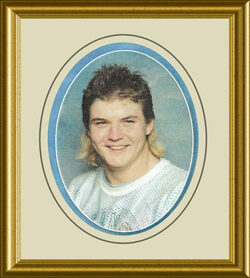 Ronnie was preceded in death by his parents Perry & Georgia and his siblings Rollie B, Hobert and Phyllis Smit. Ronnie will be deeply missed by family and friends. Visitation Wednesday, October 19, 2016 from 2-8 p.m. at the Taylor Chapel of Voran Funeral Home, 23750 Goddard Road. (313) 291-1800. Funeral service Thursday 1:00 p.m. at the funeral home, officiated by Rev. 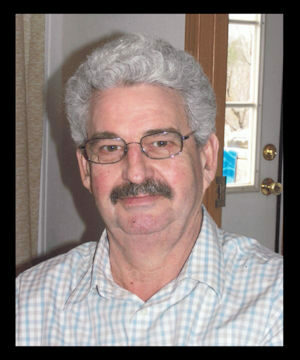 Jerry P. Grubbs. Interment at Woodmere Cemetery. 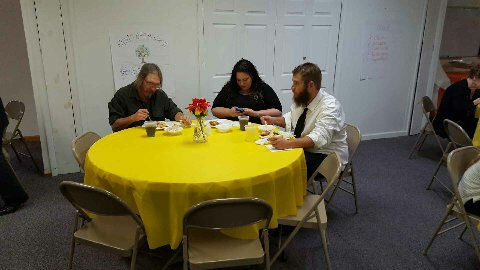 After Ronnie's funeral, family and friends met at the church fellowship hall for lunch prepared and served by the church. So soon! We have had another death in our church family. 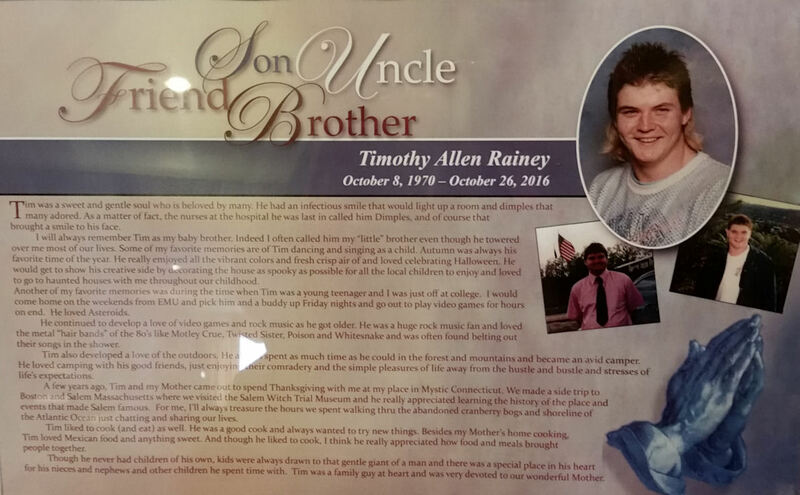 Timothy A. Rainey, son of Sister Lee Rainey passed away October 26, 2016. 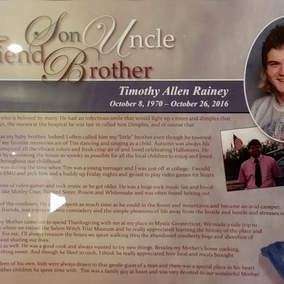 Timothy was the son of Sister Lee Rainey and Elzie Rainey. He left two brothers -- Joseph and Anthony, and one sister -- Cynthia. 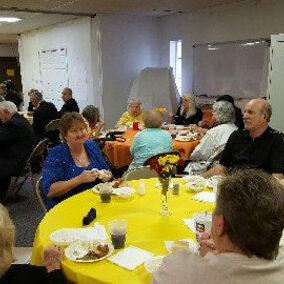 Funeral was held on October 29 at Molnar Funeral Home in Southgate. Interment at Huron Valley Cemetery. 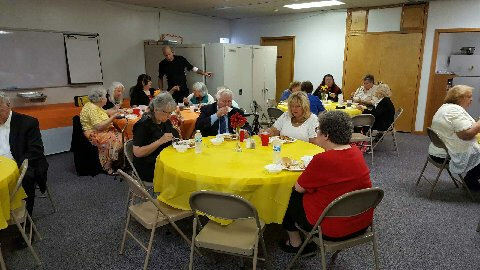 Afterward, the church hosted a luncheon for the family and friends in the church fellowship hall. 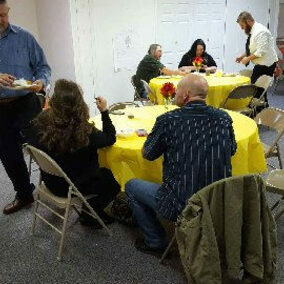 Again, we appreciate those who prepared and served food. This world was not my home--I was just passing through. My treasures are laid up--Somewhere beyond the blue. The angels beckoned me--From heaven's open door. And I could not stay--In this world anymore. 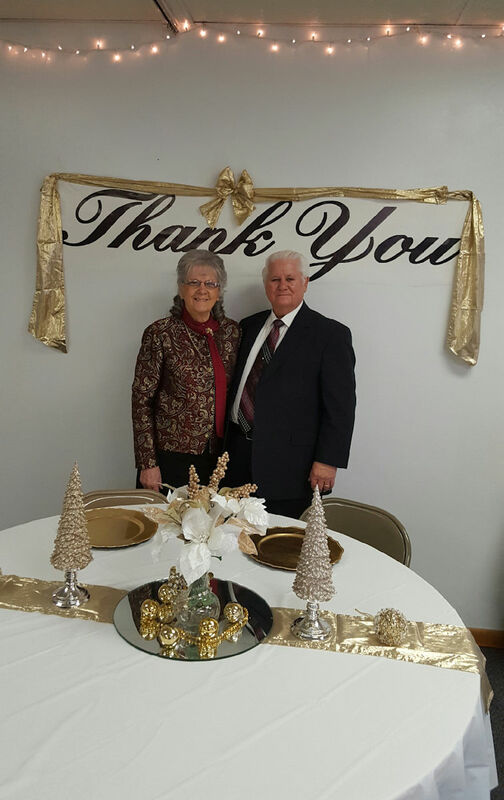 Sunday, December 4 was Pastor Appreciation Day at Faith Tabernacle. Rev. 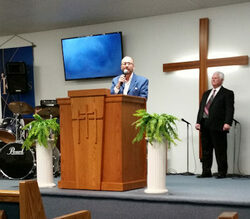 Bobby Baum and his family were with us for the morning worship service. Bro. 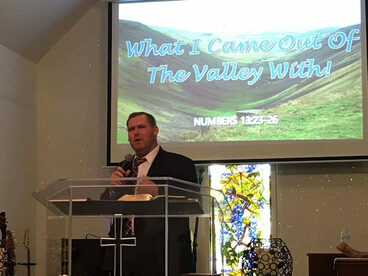 Baum preached a wonderful message with the thought of "What I came out of the valley with." 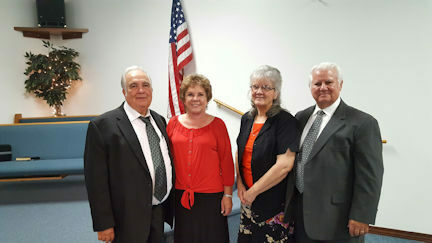 He reminded us of our blessing of having a pastor and wife who were there to guide us out of the valley victoriously. 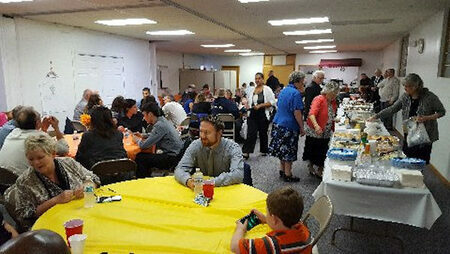 After service, a delicious meal made up of a great variety of foods from the kitchens of our church "chefs" who do that so well. 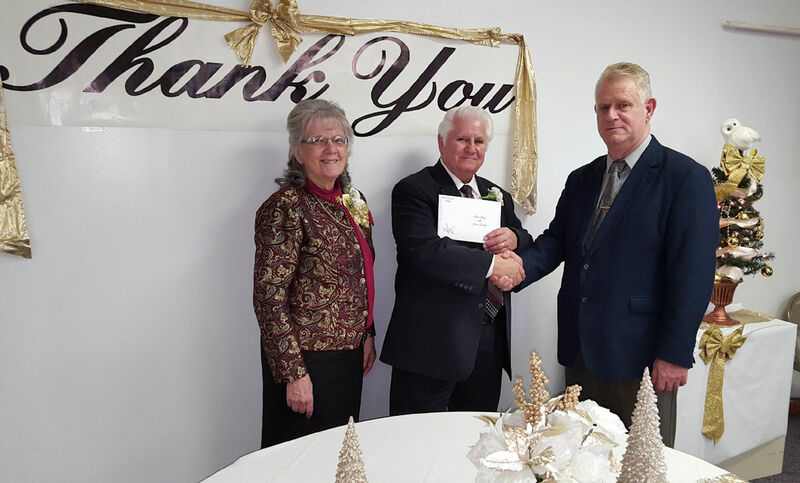 Pastor Jerry and Sister Lorinda were presented with a card of thanks and a gift of money from the church. 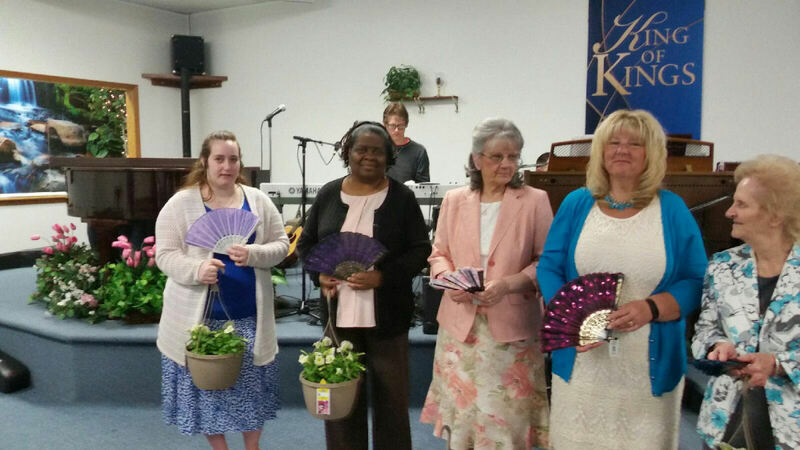 Brother Gerald Jacobs presented the gifts with a verbal "Thank You" from our congregation. 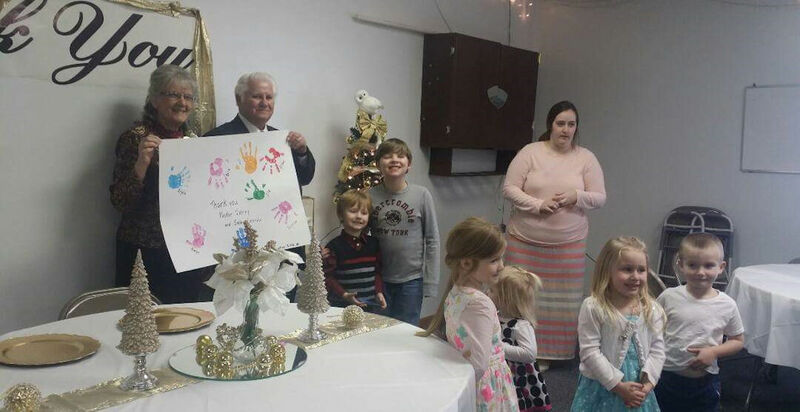 Rebecca Stoddard and some of the children prepared a poster with the handprints of the children and thank-you notes written in. 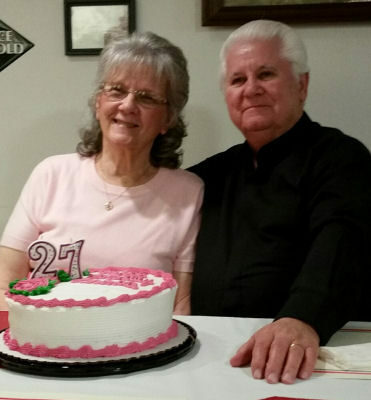 Faith Tabernacle acknowledges that we are blessed with a caring and responsible pastor and wife who take the responsibility very seriously and labor tirelessly to insure our care and growth as individuals and as a Body of Christ in our vicinity in Lincoln Park. 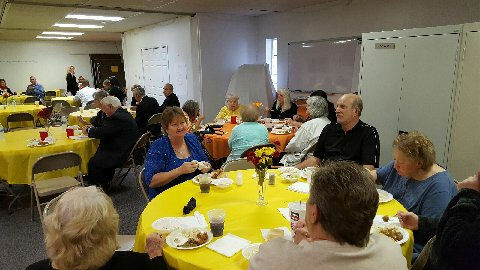 A special "Thank you" to Karen Jacobs who did a fabulous job of coordinating all the events for the Pastor Appreciation Day! 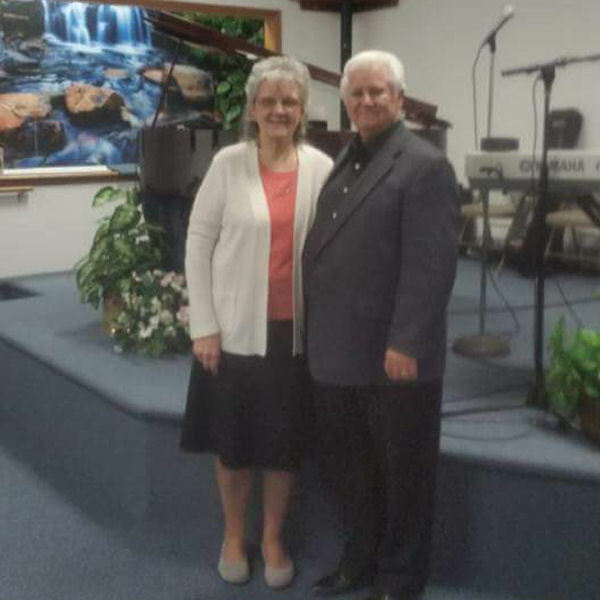 "What I Came Out of the Valley With"
Pastor Jerry and Sister Lorinda !